The temperature went above +1°C on the morning of November 28th, breaking a streak of 88 hours when the temperature stayed been between +1°C and -1°C. The longest previous streak of a 2 degree temperature range I found in the history of the UW weather station was back in 1998 between March 17th and 20th when we had 59 hours in that range. As it turns out, when I looked in the data archives any time we had over 2 days of steady temperatures, it was always very close to 0. Unfortunately, this isn't something that's very easy to get from the other data archives available so it I don't know if I'll have the time to see if this is an all-time record. I can't remember a week like this one, since Monday afternoon the temperature has been between +1°C and -1°C. The temperature graph is pretty much just a flat line. And looking at the forecast we might not break out of this cycle till Saturday. 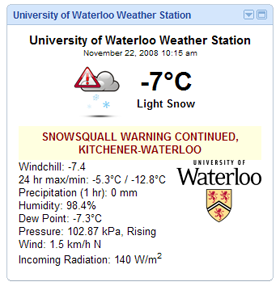 For those of you who use the iGoogle homepage, a gadget has been created that puts the latest readings from the UW weather station right on your homepage. As well as the latest readings the gadget also displays the current weather conditions (at the moment it comes from weather underground, but we are working on making current condition statements from the UW weather station data) and any current Environment Canada weather advisories. You can also set it up so see the latest postings from this blog. Thanks goes to Wayne Jenkinson for creating the gadget. Please try it out and leave some feedback. Also if there is any other way that you would like the weather station data to be delivered please leave a comment to this post. We recorded about 18 cm of snow over the weekend at the UW weather station. I hope everybody was able to find their shovels this morning. Although we don't like to talk about "daily record temperatures" at the UW weather station (see here for an explanation why), this is a noteworthy spell of high temperatures. Seeing a temperature over 20°C in November isn't that unusual, on average it happens about once every 5 years. However, getting two days in a row in November above 19°C hasn't happened since 1990 and it is only the third time since 1970. By the way, the highest all-time November temperature I was able to find was back on November 1st, 1950 when it was 25.0°C (followed by a 20 cm snowfall 3 days later). It must be fall with the battles between cold air from the north and warm air from the south, this showed up in the temperature record with lots of days that were either well above or well below average. But as often happens in this case, they cancelled each other out and we are left with an overall temperature within the average range (0.3 degrees below average for the month). For the first time since April, we had a below average month for precipitation. Only 45.0 mm fell during October in lots of small storms throughout the month with only 1 day having double digit precipitation (11.2 mm on the 8th). We have now had 907.9 mm of precipitation this year compared to the average of 754.9 mm for the end of October. So even if we don't get anything in November and December, we have now surpassed the average annual precipitation for the area (904.1 mm). However, we have slipped down to being the 8th wettest first 10 months of the year from the 5th wettest first 9 months of the year.